Contact Angle Measurements over Macro, Micro and Nano Dimensioned Systems. Review on Kinetics of Spreading and Wetting by Aqueous Surfactant Solutions. Wetting Dynamics of Aqueous Surfactant Solutions on Polymer Surfaces. Hydrodynamic Interactions Between Solid Particles at a Fluid-Gas Interface. Microdrops Evaporating from Deformable or Soluble Polymer Surfaces. Modeling Approaches and Challenges of Evaporating Sessile Droplets. Nanobubbles at Hydrophobic Surfaces. 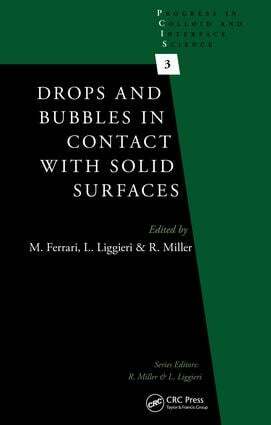 Model and Experimental Study of Surfactant Solutions and Pure Liquids Contact Angles on Complex Surfaces. Collision and Attachment Interactions of Single Air Bubbles with Flat Surfaces in Aqueous Solutions. Electrowetting of Ionic Liquids in Solid-Liquid-Liquid Systems. Single Drop Impacts of Complex Fluids: A Review. Wetting at High Temperature.